Around Christmas time, there are several movies that are played on the Television stations repeatedly. 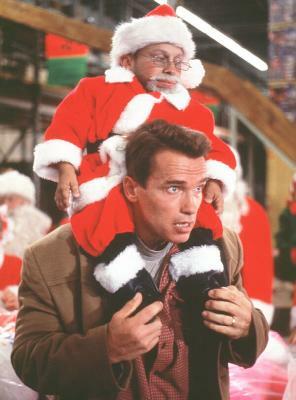 One movie in particular that I watch every year is "Jingle All the Way," with Arnold Schwartzenegger. The person that says this line is his son, Jamie, as he is describing the toy that he wants for Christmas. He says: "I want the Turbo Man action figure with the arms and legs that move and the boomerang shooter and his rock'n roller jet pack and the realistic voice activator that says 5 different phrases including, 'It's Turbo time!' Accessories sold separately. Batteries not included." I like this quote because it reminds me of my childhood where you have that one toy that you are hoping to get and you think that it will bring you happiness. The truth of the matter is that you play with a toy until you get tired of it and then you want the next big thing. The source of my true happiness and joy was when I put my faith in Jesus Christ. This movie reminds me of how we acted as children and how much happier I am now. Christmastime means much more than the perfect present under the tree, it’s about what Jesus has done for us on the cross. Join in and write your own page! It's easy to do. How? Simply click here to return to Favorite Movie Quotes.